Open Arts Philly presents a College Night CAVECAST. A limited number of free tickets for college students are available on their website. On Wednesday, November 20 at 9:00pm DJ Apt One will discuss sampling and cultural re-appropriation in dance and electronic music, something he knows a thing or two about. In 2011 he produced a collection of beats for DJs called “T&A Breaks 3: Moombahton Loops and Samples.” One of his breakbeats was used by DJ Baauer for “The Harlem Shake,” which swept youtube and nightclubs earlier this year. As a producer, DJ Apt One makes mixes by delving into various recordings and isolating parts of the tracks to be used in new and interesting ways. Essentially a sound collage, a new composition is woven using pieces taken from outside sources. Despite being made entirely of existing material, the mix transforms the elements into an original track. Sometimes a recognizable reference, sometimes highly obscure, there are many different ways to sample and appropriate music, achieving many different effects. Come to CAVECAST 011 on November 20th to learn more about this process. Subscribe on iTunes, stream from SoundCloud, or listen live! Also, check us out in the November issue of Philadelphia Magazine, in which CAVECAST earned the distinction of being “worth doing after dark”. Mat Tomezsko is the Programs and Events Coordinator at the Philadelphia Art Alliance. 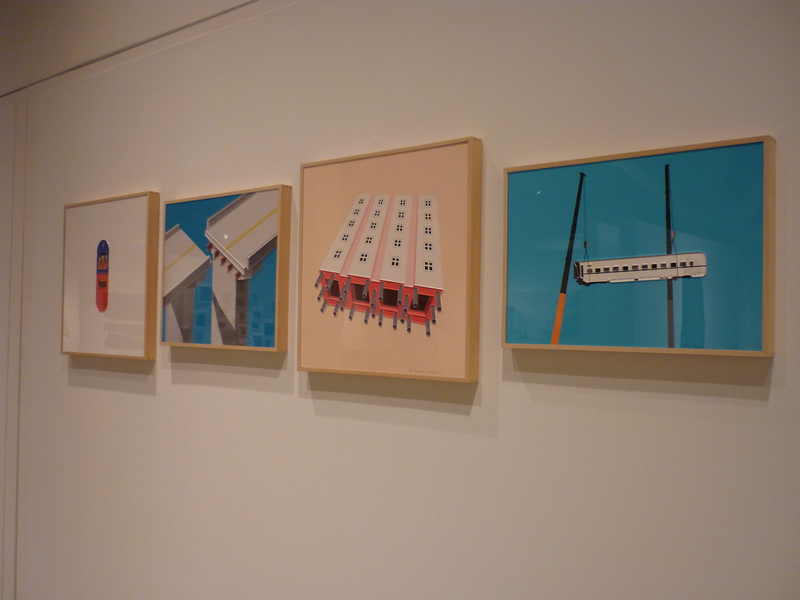 If The Way of Chopsticks has piqued your interest in contemporary Chinese art, check out these exhibitions currently on view at The Asian Arts Initiative and the Leonard Pearlstein Gallery (located in the Westphal College of Media Arts & Design’s URBN Annex at Drexel University). Hua Hua Zhang: A solo exhibition of new works by Hua Hua Zhang, master puppet theater artist and sculptor is on view at The Asian Arts Initiative now through January 24th, 2013. The show presents sculptures and other works, including masks and shadow puppets, by the Bejing-born, classically trained puppeteer and celebrated performer Hua Hua Zhang. At the opening reception held on Friday, November 1, at the Asian Arts Initiative, Hua Hua explained how she views her work as crossing the boundaries between sculpture and performance. On display, the potential for movement and story emanate from what Hua Hua calls her “living sculptures.” Removed from their podiums and expertly manipulated by Hua Hua or one of the talented members of her Philadelphia-based performance company, Visual Expressions, the puppet-sculptures indeed come to life. A short performance given during the opening reception began with the draping fabric dress of a puppet suspended from the ceiling, and enclosing another puppet reclining beneath it, beginning to sway in a breeze generated by a large hand fan. The gentle movements of the fabric woke the sleeping puppet who nonetheless remained within a kind of dream-state. As if experiencing a heightened sense of a mind-body split, the puppets head slowly separated from its body, leaving the body to perform a moving dance of self-discovery. This short performance demonstrated how Hua Hua’s work combines traditional Chinese stories and imagery, including an emphasis on dreams, with more modern, perhaps Western, themes and styles (for example, one puppet, a rhinoceros, was made out of plastic tarps, in place of another more traditional material) in an effort to explore the conflicted emotions, the pain but also the rewards, of leaving one culture and becoming part of another. Click here for more information on The Asian Arts Initiative and Hua Hua’s exhibition. Audiences are welcomed to join the Philadelphia Art Alliance for another opportunity to see Hua Hua’s work come to life. 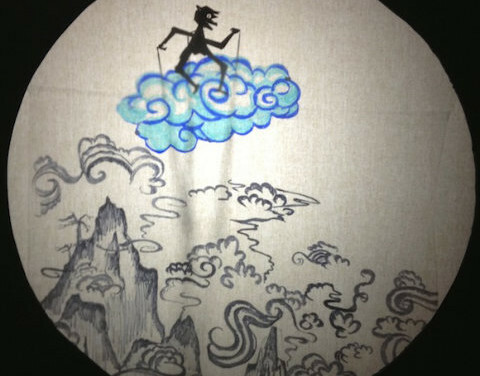 In conjunction with the Way of Chopsticks exhibition, on view through December 29th, Hua Hua and Visual Expressions will perform an original piece of shadow puppet theatre, Adventure of the Stone Monkey, at the PAA at 5pm on December 7th. All ages are encouraged to attend. Click here for more information and to register! And don’t forget to join us this Saturday, November 16th, from 10-11:30am for a The Way of Calligraphy, an introductory calligraphy workshop for children and adults ages 7 and older taught by Hua Hua Zhang at the PAA. Learn about calligraphy and make your own works to take home and see the Way of Chopsticks exhibition. Click here for more information and to register. We hope to see you there! The Start of a Long Journey: The Collection of Excellent Alumni Works from China Central Academy of Fine Arts, runs through November 22nd at the Leonard Pearlstein Gallery. The show features sixty works of art, including paintings, sculptures, and video, from 24 young alumni of the China Central Academy of Fine Arts (CAFA), China’s foremost Fine Arts Academy. Much of the work on view in this exhibition aims to analyze and evaluate the previous era of Chinese art, which, according to Alex McKechnie of Drexel University, was influenced “by the intellectual trends during the Cold War period as well as traditional Chinese wisdom.” However, these emerging artists do more than evaluate the previous era of Chinese art. Through their work, they also examine issues and conflicts of life in China today and the feelings these issues and conflicts elicit. In this way, The Start of a Long Journey relates to The Way of Chopsticks, which also explores and comments on contemporary Chinese society, though through the more personal perspective of the experiences of artists Song Dong and Yin Xiuzhen. Three notable pieces include “The Elephant Series,” “How Are You,” and “The Growth of Emptiness.” “The Elephant Series” by Zhang Yifan examines the deliberately ignored dangers born from modernization in present-day China. Although modernization in China may prove beneficial, one cannot ignore the explicit risks taken. For example, a recent building collapse was found to be a result of a faulty foundation, and air pollution in Beijing has worried environmentalists for years. Zhang explains that the light and crisp presentation of all-too-common scenes in China today contribute to the illusion of superficial peace and harmony that masks the unaddressed but present dangers. The vibrantly colored canvas of Du Pengjiao’s “How Are You” perfectly captures how the rise of social media and technology creates intricate webs of connection and relationships. Another work, Sun Mou’s “The Growth of Emptiness,” seems to grow out of a blank canvas. From a distance, the image resembles a nerve cell, a neuron, a minuscule yet vital part of the body. Delicate, lightly colored lines gracefully span the canvas, creating an illusion of emptiness and hollowness. Upon closer inspection, these lines reveal themselves to be stems of vegetation or thin branches of trees that are, also, vital to the Earth. The parallels between the neuron and tree branches as well as the “simplicity of nature,” in Sun Mou’s words, influence the viewer to question the life all around us and to not look at the forest for the trees, so to speak. The Start of a Long Journey presents these and other brilliant works by talented emerging artists. Dr. Joseph Gregory, Chair of the Department of Art & Art History, hopes that this cultural exchange will facilitate greater understanding between China and the United States. During The Way of Chopsticks exhibition, Beijing born, Philadelphia-based artist Hua Hua Zhang is collaborating with the PAA on workshops and performances that will allow audiences to further explore Chinese art and culture. Hua Hua Zhang is a celebrated artist trained in both the classical traditions of Chinese puppetry as well as modern forms of puppetry and theatre. Her work bridges the realms of sculpture and performance and draws upon Chinese tradition as well as personal experience. She is also a teaching artist specializing in introducing American audiences to traditional Chinese art forms. On the morning of Saturday, November 16th, Hua Hua will be teaching The Way of Calligraphy, an introductory workshop on Chinese calligraphy. The PAA invites adults and children ages 7 and older to join in. Click here to register! Click here for information on Hua Hua Zhang’s current exhibition of “living sculptures” at the Asian Arts Initiative. And don’t miss her production of Adventure of the Stone Monkey: A Shadow Puppet Performance, on December 7th at the PAA! Interested in calligraphy? Read more below.